Not only do we lie frequently, but we lie without even thinking about it. 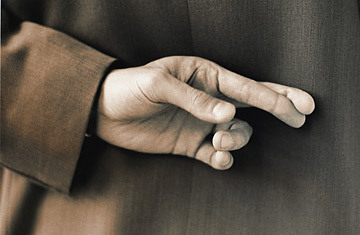 People lie while they are getting acquainted an average of three times in a 10-minute period. Participants in my studies actually are not aware that they are lying that much until they watch videos of their interactions. This is what I call the liar's advantage. We are not very good at detecting deception in other people. When we are trying to detect honesty, we look at the wrong kinds of nonverbal behaviors, and we misinterpret them. The problem is that there is no direct correlation between someone's nonverbal behavior and their honesty. "Shiftiness" could also be the result of being nervous, angry, distracted or sad. Even trained interrogators [aren't] able to detect deception at [high] rates. You might as well flip a coin to determine if someone is being honest. What's more, a lot of the time, we don't want to detect lies in other people. We are unwilling to put forward the cognitive effort to suspect the veracity of statements, and we aren't motivated to question people when they tell us things we want to hear. When we ask someone, "How are you doing?" and they say, "Fine," we really don't want to know what their aches and pains are. So we take "Fine" at face value. We are living in a time and culture in which it's easier to lie than it has been in the past. The message that pervades society is that it's O.K. to lie  you can get away with it. One of the things I found in my research is that when you confront people with their lies, they very rarely display remorse. Lying is not seen as being morally reprehensible in any strong way. You can make the assumption that because it often makes social interactions go more smoothly, lying is O.K. But there is a cost to even seemingly benign lies. If people are always telling you that you look terrific and you did a great job on that presentation, there's no way to have an accurate understanding of yourself. Lies put a smudge on an interaction, and if it's easy to lie to people in minor ways, it becomes easier to lie in bigger ways. You say in the book that recent DNA evidence suggests that 10% of people have fathers other than the men they believe conceived them. So is lying pretty widespread in our intimate lives too? You show how lying is a social skill. Does that mean it's part of an evolutionary legacy? I don't think lying is genetically programmed. We learn to lie. We teach our kids to be effective liars by modeling deceitful behavior. In your book, you offer a way to cut back on lies. What's the "AHA!" remedy? AHA! stands for active honesty assessment. We need to be aware of the possibility that people are lying to us, and we need to demand honesty in other people. Otherwise we will get a canned affirmation. At the same time, we have to demand honesty of ourselves. We have to be the kind of people who don't tell white lies. We don't have to be cruel and totally blunt, but we have to convey information honestly. The paradox here is that if you are 100% honest and blunt, you will not be a popular person. Honesty is the best policy. But it's not a perfect policy.